America faces a full-scale socioeconomic collapse—the stock market plummets, hyperinflation cripples commerce and the mounting crisis passes the tipping point. Practically overnight, the fragile chains of supply and high-technology infrastructure fall, and wholesale rioting and looting grip every major city. James Wesley Rawles has been an enthusiastic survivalist since his teenage years. He is now a survivalist author and lecturer and the editor of SurvivalBlog.com. He has a Bachelor of Arts degree from San Jose State University with minor degrees in military science, history, and military history. A former U.S. Army intelligence officer who held a Top Secret security clearance (with Special Background Investigation) and access to Sensitive Compartmented Information (SCI), he was awarded Officer specialty 35A (tactical all-source intelligence officer), and the additional skill identifier 5M (electronic warfare officer). He achieved the rank of Captain, attended the Army NBC defense officer’s course, as well as Northern Warfare School at Fort Greeley, Alaska. The book has been out for some time, but its content is timeless… So much so that the storyline could likely read more like a non-fiction history book in a few short years. Early on in the book, the main characters forge a bond and band together with other close friends in preparation for long-term survival by purchasing a small ranch located in northern Idaho where they begin to fortify their retreat and train hard in the use of defensive tactics and weaponry to protect it all the while stockpiling all of gear and resources necessary to survive for many years. There is a tremendous amount of detail provided in the book with regards to how the group prepares, what they chose to stockpile and why. 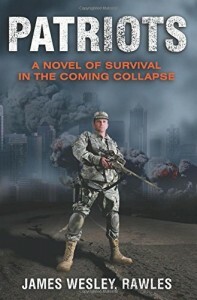 It really provides a lot of insight into the mind of a prepper and how they prepare to overcome the odds against them. As the story progresses, the markets begin to plummet and hyperinflation cripples the nation forcing the group’s survival plan into motion. Along the way, the book does a fine job at introducing, and then chronicling each member of the group as they deal with looters, refugees, other cooperative groups, a vicious gang and the onslaught of those trying to impose unConstitutional Law in an attempt to gain control over them. Patriots is a wonderful book certainly worth a read, or in my case a listen. I thoroughly enjoyed the story, and actually learned a lot of new things that I should be considering as I develop my family’s survival plan.